Back in 2006, when I had a million blog drafts, this post was created just after hearing selections from Nigel Kennedy's Vivaldi II on the radio just after it was released. I have listened to classical music all my life, and fashion myself to be somewhat of a snob and connoisseur of classical performers. But I had never heard of Nigel Kennedy. My violinist collection contained classic performers such as Jascha Heifetz and Ruggiero Ricci to current day performers such as Joshua Bell and Anne Sophie-Mutter. All passionate players with impeccable virtuosity. 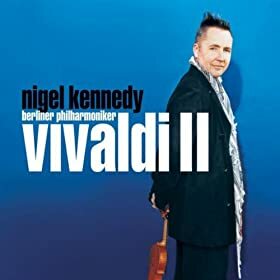 When I heard the recording of Nigel Kennedy playing these lesser known works of Vivaldi, I was surprised and even a bit offended at first. Where those slides I heard? And furious growling of the strings? How utterly uncivilized! But then I bought the recording and listened to it again. And again. And I was hooked. Kennedy takes the violin to a new level of virtuosity, passion and depth. Later I purchased Nigel Kennedy's recording of The Four Seasons after my family started to learn the violin a couple years ago. My original recording of this piece was with Isaac Stern, and was quite solid. But Nigel Kennedy's version had insanely fast tempos, completely different styles for each movement and extra flair whenever possible. It was a bit much at first, but after listening to it several times, I got used to inhumanly fast speeds and looked forward to the extra bits of twang. I listened to the Stern performance for comparison, and it became downright boring, simply slow and perfect. With the CD/DVD, there were videos of Nigel Kennedy performing movements from The Four Seasons surrounded by candles (sort of like the music video of The Police - Wrapped Around Your Finger). I forced my kids to watch it as an educational thing. The kids were fascinated by the huge amount of rosin accumulated around his bridge area, where we had been taught to wipe after every practice. At one point, a bow hair becomes loose and it is flying around as he jumped around and played. As a finale, he performed the third movement of Summer and Adam asked to see it over and over again. He loved this performance so much, that it became the song on his iPod that he woke to every morning. My little classical music boy! The brainwashing is clearly working. In this video of the Summer 3rd movement, Nigel Kennedy's flamboyant style is clearly contagious with members of his ensemble who clearly share his energy and zeal. It's almost like a rock concert. My favorite movement of The Four Seasons has always been the first movement of Winter. The beginning is more Halloween to me than winter, with tree branches scratching against a window, before it explodes. This video is of a younger, more subdued, but no less brilliant Nigel Kennedy. He clearly embodies Vivaldi like no one else. 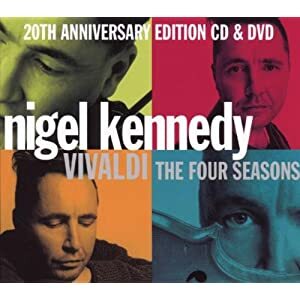 If you are interested, I recommend getting the definitive Nigel Kennedy recording of Vivaldi: The Four Seasons . It will take you off this planet to a realm of pure genius.